Lakota Declare independence From US-Will Maori Imitate their Tactics? For many years New Zealand Maori radicals and North American Indian activists have been building revolutionary ties. Now the Lakota Sioux, lead by Russell Means of American Indian Movement fame have declared independence from the US. Already they are soliciting recognition from the embassies of neo-communist Venezuela, Bolivia, South Africa and socialist Chile. I'm betting that Tuhoe or other Maori tribes will try similar stunts in the coming years. WASHINGTON (AFP) — The Lakota Indians, who gave the world legendary warriors Sitting Bull and Crazy Horse, have withdrawn from treaties with the United States, leaders said Wednesday. "It is also within the laws on treaties passed at the Vienna Convention and put into effect by the US and the rest of the international community in 1980. We are legally within our rights to be free and independent," said Means. Means might suggest that he's a Capitalist and a Libertarian since he ran on the Libertarian ticket against Ron Paul but he's involved with a bad crowd who'll only exploit indigenous folks like Means for nefarious purposes. I have also documented Means' association with Ward Churchill and Means' group-American Indian Movement trying to get a convicted murderer-Leonard Peilter off scot free and having Amnesty International suggest that Peilter is a "political prisoner" even though the far left Peace and Freedom Party had given him position as their candidate in 2004 election race. The American Indian Movement also supported the Contras to which have been re-incorporated into the neo-Sandinista government and a former Contra is also the Nicaraguan VP for the neo-Sandinista regime. Thanks MAH-I forgot to attribute you BTW. While Means was involved with Libertarians and goes on about private property, I regard him as more of an anarchist. Certainly he courts the left enough. He's definitely not my brand of libertarian. "Now the Lakota Sioux, lead by Russell Means of American Indian Movement fame have declared independence from the US." and you have a problem with that? or you agree with that? "and you have a problem with that? or you agree with that?" The problem is when someone like Hugo Chavez wishes to buy off someone like Russell Means, and Means himself inviting neo-Communist leaders of Latin America who are close to totalitarian superpowers like Communist China into the frying pan. The Lakota have had indigenous sovereignty now for over 100 years. What is the end result of indigenous control? The Pine Ridge reservation is the poorest place in the US. Now how is declaring independence going to change the poverty and lack of development? It won't. Indigenous rights is for fools who want to live in poverty. I have a big problem with it. The Lakota people (or the Sioux nation) are not led by Russell Means. The Lakota Nation is composed of eight groups, each with a Tribal Council, duly elected, and a Traditional Council which conducts its affairs in the Lakota language that Russell Mmeans, brought in white schools, does not understand or speak fluently. Neither Russell Means nor any of the three individuals flanking him belong to an official body recognized by the Lakota and none of them can claim to speak for the people or in the name of the lakota Nation. Before the signing of the treaties, the Lakota people were nomadic and did not think in terms of land title, deeds, and ownership of land. These concepts were brought by people who measured the land, bought and sold land , and established borders. 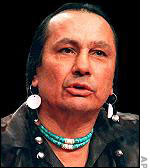 Therefore, if Russell means wants to revert to the twilight Utopia of pre-treaty Lakota life, he will have to forego all concepts of land ownership or any form of capitalist exploitation of this land.